Embark on an iconic Transatlantic Crossing on board Queen Mary 2, Cunard's flagship. Spend 7 nights enjoying the style & countless charm of this ship. 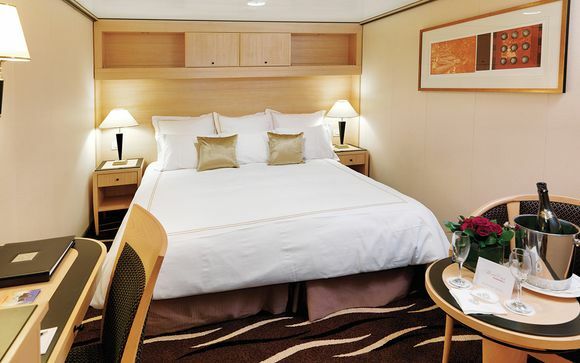 If you choose an Ocean Stateroom, departing on 24th May you will receive a complimentary upgrade to a balcony stateroom. Spend 3 night nights exploring New York from your excellently placed modern hotel, just blocks from Broadway. Queen Mary 2 was launched by the Queen in 2004, and 12 years later has been treated to a £90 million makeover – the most expensive refit for any ship in Cunard’s 176-year history. Renowned for its incredible dynamism, New York is one of the world's most exciting cities. 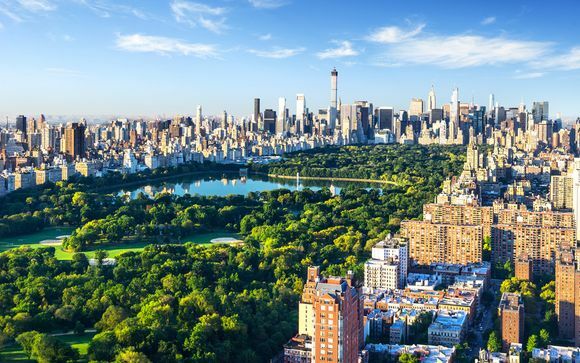 Home to venerated restaurants, chic nightspots, cutting-edge theatre and architectural masterpieces, New York City is forever on the cusp of reinvention, its creativity fuelled in no small part by inhabitants who hail from every corner of the globe. Visiting the city's iconic sights is only part of the appeal of this metropolis. The shimmering lights of Broadway, the jazz clubs of downtown, the indie rock scene of Brooklyn, and highbrow cultural fare at Lincoln Center are all part of the incredibly varied cultural scene. And those more interested in shopping have much to celebrate in New York City, with an astounding collection of colourful boutiques, high-end department stores and edgy shops selling cutting-edge couture. New York City is also a dining mecca, with thousands of restaurants serving up all the world's cuisines. This is a big ship packed with reminders of the glory days of transatlantic crossings, from art deco features to pictures of the Hollywood stars who graced Cunard ships of old. 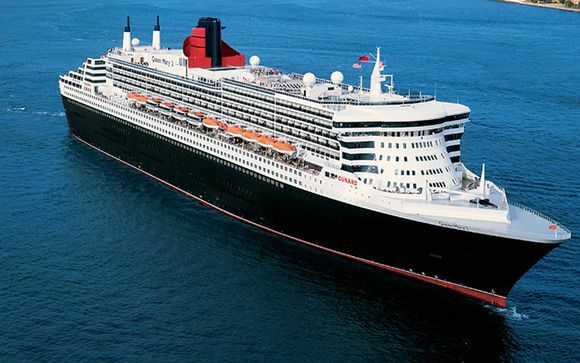 Queen Mary 2, was famous even before her first sailing and a worthy heir to Cunard's rich legacy. Her every detail harkens to the Golden Age of Ocean Travel, while providing one of the most modern luxury cruise travel experiences on earth. Guests will be delight in her accommodation and renowned restaurants, her breathtaking Grand Lobby and the amazing array of unsurpassed amenities she offers. From bow to stern, discover 14 spacious decks on which to relax and unwind; to indulge in pleasures and pursuits you never normally have time for. Opulent public areas, extravagant dining rooms, ballrooms, theatres, lounges and even the only Planetarium at sea. Days at sea were a whirl of quizzes, spa treatments, dance lessons, balls and stargazing in the only planetarium at sea. 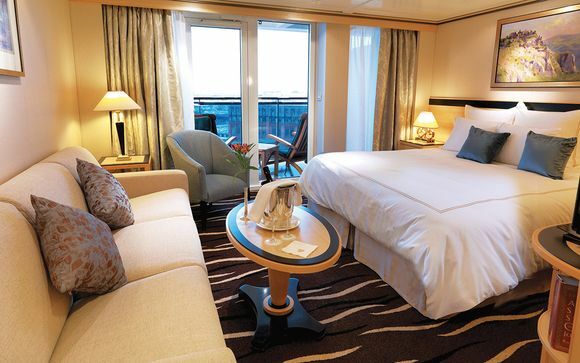 You may choose from an Inside, Ocean View or Balcony Stateroom. If you select an Ocean View Stateroom departing on 24th May you will receive a complimentary upgrade to a balcony stateroom. Choose an Inside Stateroom and you will find that your living accommodation is anything but ordinary. Enjoy nightly turndown with a chocolate left on your pillow. These thoughtful touches are sure to make you feel right at home. Natural light and stunning views create a perfect oasis. An ever changing seascape will captivate you, no matter where in the world you are. Please note that your view may be sheltered or restricted. You will spend 3 nights in a Standard Room at The Yotel New York on a room only basis. Located just two blocks west of Times Square on the corner of Tenth Avenue and West 42nd Street, this hotel is the perfect antidote to the hustle and bustle of the city. Everything in this hotel is apologetically modern: automated airline-style check-in kiosks, a handy mobile concierge app to keep everything at your fingertips and YOBOT, their friendly luggage-storing robot. This smartly designed space features the signature ‘SmartBed’, that comes with a ‘Serta’ mattress designed exclusively for YOTEL. The convertible queen bed glides at the touch of a button to any position to relax, work or sleep. Flights: A one way flight with Norwegian Airline with 2 items of hold luggage per person (20kg each) is included. Our members can choose between Economy or Premium seats. Public Transport: Your hotel is approximately 10min / 850m from Times Square 42nd Street Metro Station which is on lines N, Q, R & W with direct access to Central Park, Brooklyn & Tribeca. Flight details are given as a guide only and may change. We will however notify you in advance if flights are more than 2 hours outside the time range given. Flights are non changeable and non-refundable at time of booking. The flight inclusive offer(s) shown on this page are ATOL Protected by the Civil Aviation Authority. Voyage Privé is acting as agent for JTA with ATOL number 4110 and your contract is with that company.